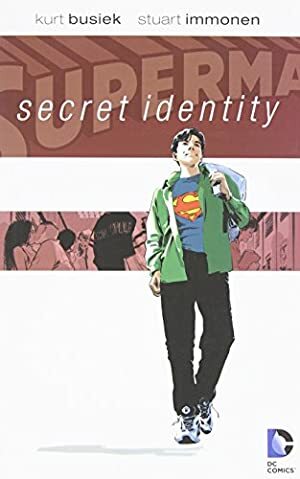 Secret Identity was a 2004 Prestige Format DC Comics mini-series by Busiek and Immonen. It is akin to the “imaginary tales” of the Silver Age , presenting an alternate version of Clark Kent living on a Earth without known superhumans. Thus, this is more of a life story about growing up, handling tremendous power in secret and growing old. This profile has S P O I L E R S about this excellent story. Known Relatives: David Kent (Father, deceased), Laura Kent (Mother, Deceased), Lois Chaudhari-Kent (Wife), Carol Kent (Daughter), Jane Kent (Daughter), Perry (Grandson), Jimmy (Grandson), Clark (Grandson). Base Of Operations: McCloskey Island, Maine, United States of America. Height: 6’3” Weight: 225 lbs. Superman’s strength level varied greatly over the span of his life. In his prime, he possessed vast superhuman strength allowing him to lift (press) thousands of tons at once. He claimed to be capable of juggling ten house-sized boulders without strain, he has towed cruise ships to shore, and caught and controlled a massive bullet train travelling at a speed over 600 miles an hour with nothing more than the strength of his body and his sheer will. With age though, his strength diminished to the point where he felt some strain supporting a single house-sized boulder. Somehow, Superman possesses the same suite of Kryptonian powers that his fictional counterpart does. In his prime, for all intents and purposes he had unquantifiable superhuman strength, endurance, recuperative abilities and resiliency to harm. He was capable of resisting impacts from intense concussive forces including that of an anti-tank missile without sustaining any form of visible injury. He was virtual immune to the effects of heat or cold, and could easily withstand the effects of the vacuum of space for as long as he could hold his breath (which was clearly for hours). Superman possesses the gift of flight, and could easily exceed escape velocity within moments. This speed also lent itself to his reaction time and land velocity as well. With concentration, Superman could emit highly volatile radiant energy from his eyes in a form that he called his “Heat Vision”. These beams were “hot” enough to vaporize metal within seconds, and he could guide the beams with literally pinpoint accuracy. Finally, Superman’s senses were enhanced in ways even he could not understand. He could literally see what was occurring on the other side of the earth, and hear what was going on in the instant that it occurred as if he were standing right there in the moment (in DC Heroes terms, Acuity used to mimic Remote Sensing). Eventually Superman came to suspect that his abilities were actually psionic based that he willed into physical form/action. He came to this conclusion due to the manner in which he was able to perceive events thousands of miles away as they were happening with no delay for the sound waves to actually reach him, and the manner in which his invulnerability seemed to shut down whenever he went to get a hair cut or to have blood drawn. Superman was a talented author, and had several books published on topics regarding cultural development and systems analysis. 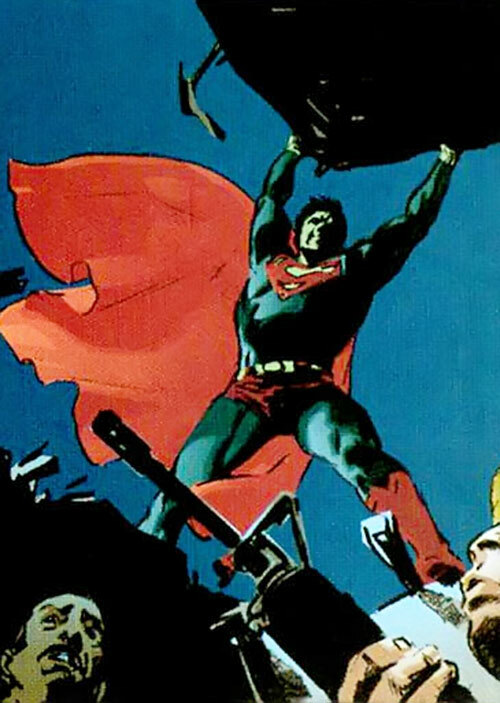 Though he had no vulnerabilities to Kryptonite or magic (as he never encountered them), Superman proved to be far less durable than his fictional counterpart. His resistance to harm seemed to be somewhat limited when faced with sources of intense electrical current. Clark Kent was born and raised in rural Kansas, to a loving couple who thought it would be neat to name their son after the world famous fictional hero, Superman. Clark, however, did not grow up thinking so. He deeply resented the name, but accepted the inevitable Superman paraphernalia he received each year on his birthday graciously and endured the constant teasing he received from his peers with a patient smile as he grew into a teen. During those times when the teasing got to much, Clark would retreat into the depths of his father’s corn fields, and captured his thoughts and feelings on the keys of an ancient typewriter he found in his father’s attic. On one such excursion, Clark typed and typed until fatigue overtook him and he fell into a deep sleep. When he awoke, he had discovered that something startling had changed in him while he slept. He was literally hovering a few feet in the air. His discovery filled him with elation, and in moments, he found himself soaring like a professional through the Kansas sky. It took him several hours to convince himself that he wasn’t dreaming. His disbelief quickly faded though, as he discovered through experimentation that he had all of his fictional counterpart’s powers. He had the strength, the invulnerability, the senses and best of all; he could fly. Elated, Clark wanted to share his discovery with his family and the people he went to school with. But something deep within prevented him from doing so. While he wasn’t above using his powers to avoid the boys who tormented him, he otherwise kept his powers a secret. It wasn’t until a massive flood engulfed the town that Clark first used his abilities to help people. When he realized that there were people in danger, he sprung into action at superhuman speeds and rescued as many people as he could. Despite his best intentions, he was seen. No one could recognize him, but the people of Kansas realized that they had a genuine “Super Boy” living amongst them. Clark began to enjoy his secret notoriety, until he realized that there were several strangers stalking throughout the town, many of whom wore dark suits and even darker sunglasses. Caution bloomed within the young man, and he decided to keep his abilities a secret until he was ready to face the world. He eventually chose to speak with a young reporter named Wendy Case, who was the first reporter to actually believe in his existence and report on it. He contacted her anonymously and only met her at night when he could easily conceal his identity. The two spoke a few times, but when he discovered that Wendy was preparing to video tape him surreptitiously, he grew angry and utilized his heat vision to destroy her equipment. He then flew away and decided to reveal himself during the town’s annual Halloween carnival. On the night of the festival, Clark donned an old Superboy costume he received as a gag-gift on his birthday and strutted into town prepared to show the world what he could do. Before he could do so, a vicious explosion rocked the town and the ensuing damage threatened its inhabitants lives. Without pause, Clark flashed into motion and saved as many lives as possible. His efforts culminated in a spectacular rescue of his long-time crush Cassie who had been pinned under a large I beam that had fallen atop of her. Even as Cassie looked upon him with stars in her eyes, Clark looked at the gathering crowd who stared at him first with awe. It took only moments though for the crowd to turn ugly. Reporters started to push and shove their way towards him; first and foremost was Wendy Case who angrily declared that he was hers. Clark, seeing the ugliness of the people around him, made the only decision he could. He let the I beam slip awkwardly from his hand (after grounding one of the ends into the earth) and let it fall atop of him, pretending to be pinned to the ground. The observers quickly jumped to the conclusion that Clark had faked the entire thing, and that he didn’t have any true “super powers”. With that, the scrutiny of his home abated and Clark returned to “normal” life, with one exception. His main tormentor, who turned out to be Cassie’s boyfriend, was grateful for Clark’s intervention on her behalf and decided to leave him be from that point forward. For Clark, it was enough. When Clark came of age, he moved out of rural Kansas and moved to Manhattan looking for opportunity. He had become an aspiring writer over the years, and had become a fairly competent columnist in one of the local newspapers. The fact that he was a writer named Clark Kent wasn’t lost on his editor or his co-workers, and despite his best efforts the teasing began once more. Despite this, Clark continued his life as normal. He worked 9 to 5, had a full dinner, watched a little television… and saved lives. He was as careful as possible, but the stories had begun once again. For the most part, he wasn’t seen but every once in a while, Superman was glimpsed rescuing people. You see, Clark had taken to wearing a copy of his fictional counterpart’s costume while using his powers, as anyone who saw him in action would be hard pressed to explain how “Superman” had saved them. One particular night, Clark took his co-workers up on their invitation to drinks after work and met them at a local bar. When he arrived, he was frustrated when he realized that the entire invitation had been a setup for a joke. His coworkers had invited a particularly beautiful young woman named Lois whom he was supposed to meet. To Clark’s surprise, Lois was equally as frustrated by the joke and stormed out of the bar. Intrigued, Clark followed her, and after suing for peace the two shared a romantic evening, which eventually led to an honest relationship. Everything seemed to be falling in place for Clark; he had Lois, he had gotten a book deal and was well on the way to becoming a successful author, and his rescues continued unabated. This was all true, until Clark was lured into rescuing a capsized boat. Even as he swooped in to save the passengers, he heard a high-pitched whirring sound that was out of place and before he knew it, he was surrounded by dark helicopters. The helicopters were armed with a particularly vicious weapon that discharged large bolts of electricity. The electric weaponry ripped through Clark again and again, each volt sending him deeper and deeper into a painful haze. Eventually, he succumbed to the weapons and passed out. There was no way for Clark to tell how long he was unconscious, but over a few days he awoke sporadically as the drugs his captors used to keep him asleep wore off. He heard snippets of their conversations, often remarking with wonder at his uniqueness and the amazing strength of his body. Eventually, Clark’s wondrous constitution grew accustomed to the drugs his captors pumped into his system and he regained consciousness in a flash. He awoke to find himself in a massive tube filled with a viscous fluid with a breathing tube forced down his throat. 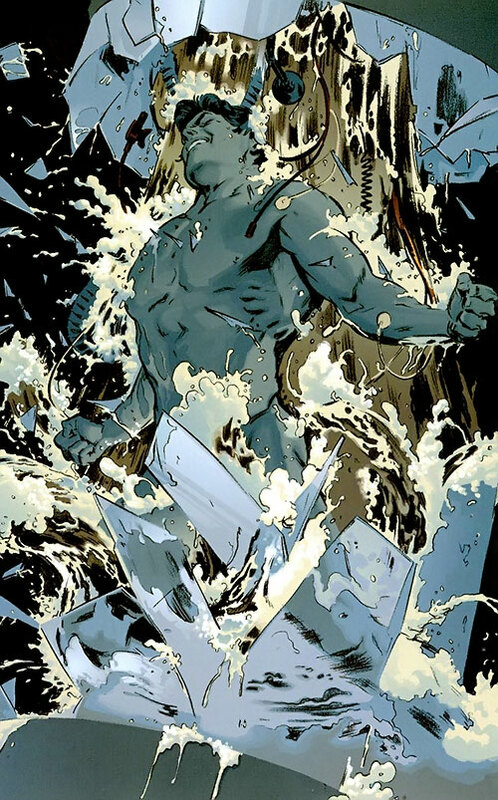 Rage filled Clark’s heart as he shattered his prison. When he looked around, the scene that met his eyes was straight out of a horror movie; there were remains of human dissections about him. Some of the remains were those of children. Clark stormed out of the facility, rendering every guard that crossed his path unconscious and freeing any other prisoner he could find. His anger knew no boundaries as heat flashed from his eyes and he burnt the entire building to the ground. He watched the building as the flames consumed it for a time, and then eventually returned to his Manhattan home. Fear kept him there for a while, as he realized exactly how long he had been gone. He decided to start wearing glasses, in the hopes that anyone who had been looking at him for the last few days wouldn’t immediately recognize him upon first sight. His fear made him push even Lois away, who had assumed that she had done something wrong to him, but refused to give up. The two eventually made up, and in a moment of utter surrender, Clark revealed his powers to her. Rather than panic or reveal his secret to anyone else, Lois returned Clark’s trust and kept his secret. With Lois by his side, Clark regained his centre and returned to performing his rescues albeit in a far more cautious and less innocent fashion. Over the next few years, Clark’s life settled into a familiar rhythm. His writing career exploded, and he became a staple in the academic field of Systems Analysis. He married Lois, and his rescues continued unabated, despite the governments continued interference. He had grown familiar with their tactics, and their attempts to capture him had transformed from a true threat into a game for him as his knowledge of his own capabilities matured. Eventually, the inevitable happened. Lois became pregnant. Clark was initially elated, but as his initial reaction faded, that old fear began to creep back into his heart. He was absolutely terrified about the possible ramifications that his superhuman powers could have on Lois or the babies. Worse, if the government managed to capture him or discovered Lois there was no telling what would happen. Clark decided to take definitive action rather than waiting for his fears to come true. One night, he went to one of the “fake” rescues that his pursuers had set up for him and simply sprung their trap. As the government forces surrounded him and attacked, he simply surrendered and asked for the chance to parlay. It was at that time when he first met Agent Malloy. The two chatted briefly about what Clark had to offer Malloy, if the government would only back off their attempts to discover his identity or capture him. The conversation seemed to go well, until a particularly trigger happy agent thought Clark was making a move and opened fire. The agents unleashed everything they had on Clark including the dazzling electric cannons they used to bring him low many years prior. This time, however, Clark proved to be more resilient to the weapon and managed to escape. Refusing to give up, Clark spent the next several days playing practical jokes (all related to Superman) on the American government at large, going so far as to physically switch nuclear missiles from one location to another without anyone’s knowledge. This forced Malloy to speak with him directly, and the two came to a mutually beneficial agreement. Clark would undertake non-political missions for the government in return for being left alone. With their new agreement, Clark’s life became quite simple. His rescues continued without interruption, he was free to write, and he watched with bated breath and Lois continued to grow in size as the delivery day approached. 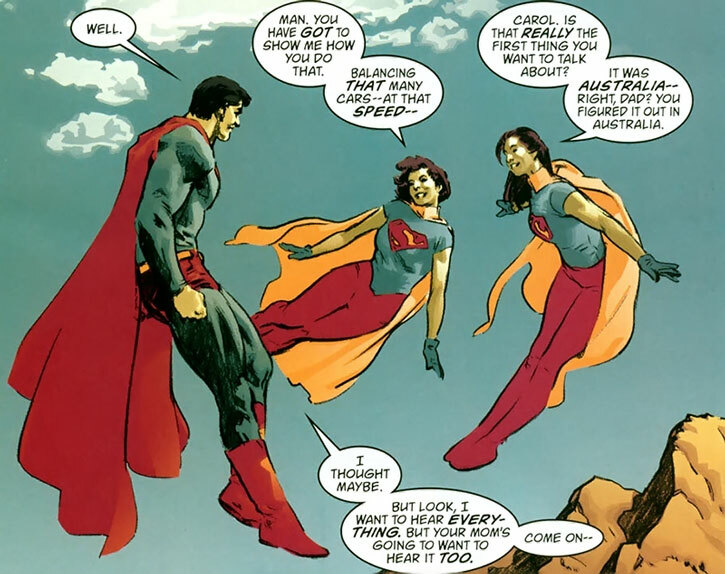 On that particular day, Clark was forced to participate in a mission to rescue hostages in a middle-eastern country when Lois had entered labour. His daughters were born while he was over one thousand miles away, but even as he rescued the hostages he watched and listened to the entire thing. Clark eventually returned to the hospital when the hostages were freed and safely on their way back to the United States. Lois greeted him warmly and introduced him to their children, at which time Clark swore that he would keep them safe no matter what it took. Many, many years later, Lois and Clark had accomplished everything they had set out to do. Clark was an accomplished writer and Lois had become a famous designer. Their daughters Carol and Jane had both grown up and had become wonderful women. The two took turns teasing their father, and always brought him Superman related gifts on his birthday. Despite their closeness as a family, Clark had never revealed his powers to them. The moment never came up, and he wanted them to live as normal a life as possible. As the years past though, Clark noticed a troubling fact. His powers were fading. Oh, he was still stronger than a locomotive, but he had to actually work to accomplish the same things that had come so easily to him in the past. His senses had begun to dim as well. Despite this, he continued to work with the government and rescued as many people as he could. Almost in spite of himself, he and Agent Malloy struck up an unusual friendship even though Malloy had no idea who he really was. He also discovered that the source of his powers were the result of a meteor shower in his youth that exposed him to mutagens that granted him his abilities. One day, while fighting a particularly stubborn tornado, Clark realized that its winds were dying down on its own. Dumbstruck, he hovered in place for a moment and in that second his dimming super-hearing picked up a sound that could only be one thing, elated laughter. Clark returned home and told Lois about what happened and how he felt that it had to have been one or both of their daughters. Rather than push it, he let the matter be until the twins were willing to speak with him about it. 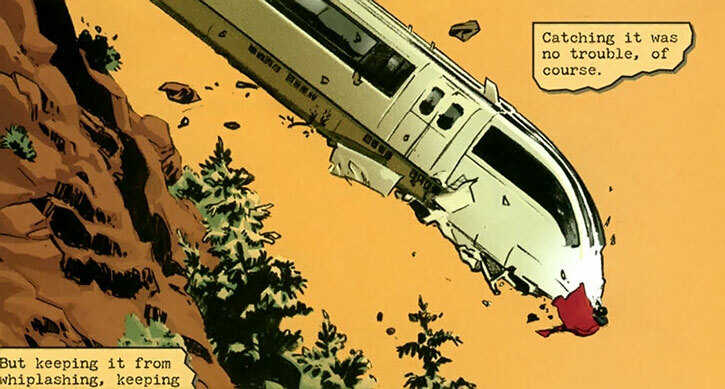 The time came when Clark was attempting to rescue a derailed bullet train. Even as he began to bring the massive projectile under control, Carol and Jane dropped out of the sky and lent him a pair of helping hands, rescuing the passengers and impressing him with their control. The two had manifested their own powers when they were teenagers and had been recruited by the government many years prior. With the twins in the government’s employ, the need for Clark dropped significantly and so when Agent Malloy eventually retired, so did Clark. Whatever happened to the Man of Tomorrow ? Many years later, Clark still enjoyed life. Carol and Jane had grown children of their own, each super-powered and the world had grown to accept that super-humans lived among them. Clark published a book about the research he had done on his own origins, but kept him family name out of the publication. And despite his age, he still flew. Superman’s appearance has varied greatly as he aged from a teenaged youth to a senior citizen. 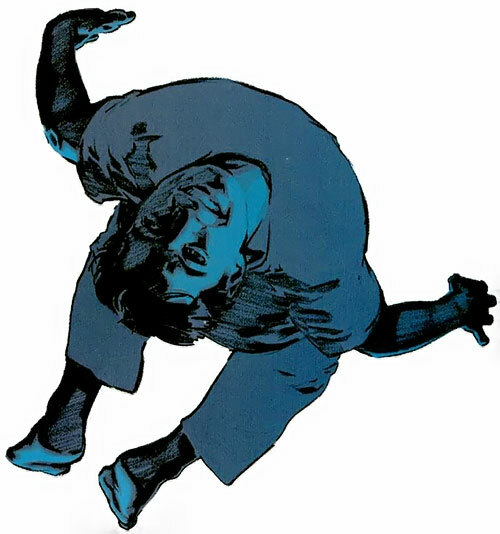 In his teen years, Clark was a mirror image of his fictional counterpart. He appeared to be a relatively average, if not handsome, fifteen to sixteen year old boy. His frame wasn’t overly large or tall, but he was clearly fit. He had a shock of dark black hair, and a hint of that familiar “S-curl” hanging onto his forehead. Under normal circumstances, he dressed as any other youth his age would, except most of his clothing was relatively baggy. In his one public appearance as Superboy, he wore a store bought version of Superboy’s familiar costume. As he matured into adulthood, Clark’s frame filled out with several dozen pounds of pure muscle and he eventually stopped growing when he was a few inches over six feet tall. He continued to wear his dark hair loose and unstyled, and his eyes became an even more piercing shade of blue. He continued to wear clothing that hid exactly how fit he was. He took to wearing dress shirts and sweaters over a pair of jeans. He eventually took to wearing a nerdish pair of glasses in the hopes that someone who had only seen him for a second wouldn’t recognize his face immediately. When using his powers, he wore an exact replica of his fictional counterpart’s costume. Finally, as Clark grew into old age, his massive frame grew more slender as his access muscle mass deteriorated. His once this dark hair thinned, and turned a solid shade of grey. He took to wearing glasses for more than just a disguise and wrinkles started to show themselves on his face. By that time, his powers had begun to wane and his costume reflected that. It became thick and more practical, as he had started to feel the atmospheric effects of high altitude flight. Instead of a spandex top, he took to wearing a padded jacket-like top that was still emblazoned with a proud “S-shield”, with a long red cape that fastened to its exterior. Even in his youth, Clark was an exemplary young man. He cared deeply for those who surrounded him and had the patience of an oak tree. For the most part, he put up with all of the taunts and jokes regarding his namesake with a nod and a smile even though it annoyed him for years. When he first manifested his abilities, he chose to use them to help others and get away from the noise of his life instead of using them for personal gain. Clark is a deeply pensive individual and was always (and continues to be) a man who likes to get away from it all. He tends to avoid loud and crowded places and whenever he truly needs to think, he leaves all of the commotion of the world behind and flies to a remote location (whether it’s the depths of space or an isolated mountain top) where he can clear his mind. Clark deeply loves his family, and will do any and everything to protect them. He was willing to confront his former tormentors in the government and sue them for peace, instead of simply destroying them, in order to ensure his family’s safety. When he initially suspected his daughters had gained abilities like his own, he cared enough about them to let them tell him themselves when they were ready instead of forcing the issue. Simply put, he loves them. 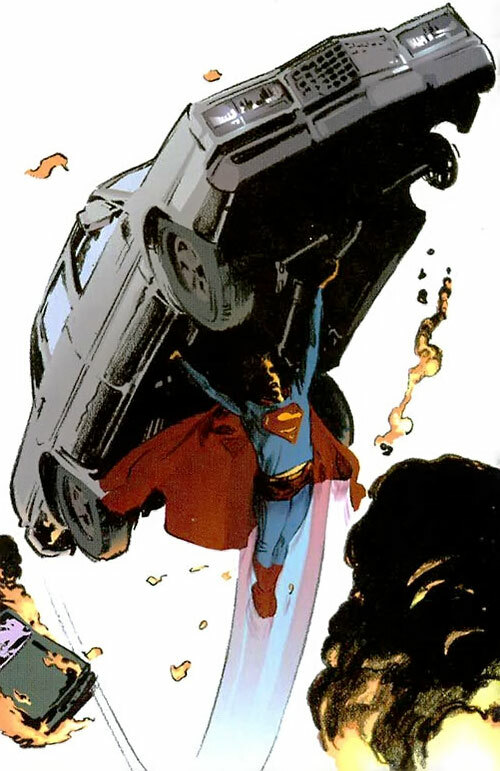 This particular version of Superman exists on an Earth that greatly resembled Earth-Prime, the alternate earth that Superboy-Prime hails from in a pre-crisis setting. 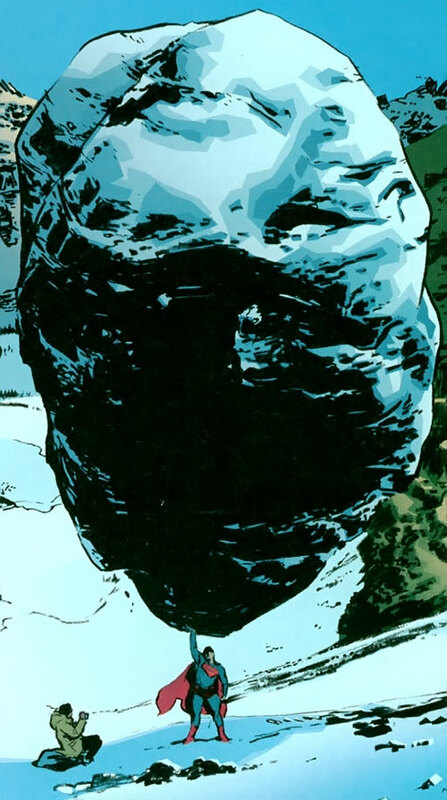 With the upheaval and changes that have been brought on by Infinite Crisis and its follow on Flashpoint, it is unknown if he (or his world) still exist. It is quite possible though that he does exist on one of the “Nu52” Earths at present. Acuity can only mimic: Directional Hearing, Extended Hearing, Microscopic Vision, Super Hearing, Telescopic Vision, Thermal Vision, or X-Ray Vision (-1FC). Skin Armor can be temporarily disabled subconsciously (+1FC). Area Knowledge (Kansas, Boston, Maine), Restricted Headquarters (House in Maine), Lightning Reflexes, Scholar (Cultural Development, Systems Analysis), Sharp Eye. Superboy: Drop STR & BOD and all powers by 2 APs, and gains the Age (Young) drawback. Superman (Middle Aged): Drop STR 2 APs, and all other powers by 1 AP and remove Sharp Eye advantage. Superman (Old): Drop Dex by 1 AP, STR & BOD by 3 APs, and all other powers by 3 APs, and add the Age (Old) drawback while removing his Lightning Reflexes and Sharp Eye advantages. 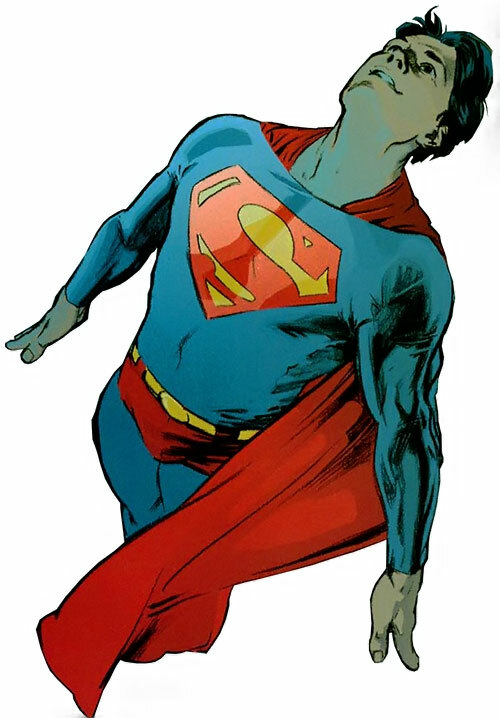 Source of Character: DC Comics Prestige Format series – Superman: Secret Identity, written by Kurt Busiek and illustrated by Stuart Immonen. Helper(s): William Chamberlin, Roy Cowan. Writeup completed on the 19th of April, 2013.